The Internet era has given a boost to online shopping and banking which has ultimately led to online fraud and identity theft. Online transactions always carry some risk, but consumers can incorporate many things to increase their security on the web. If you take just the right precautions, you can avoid these threats easily. 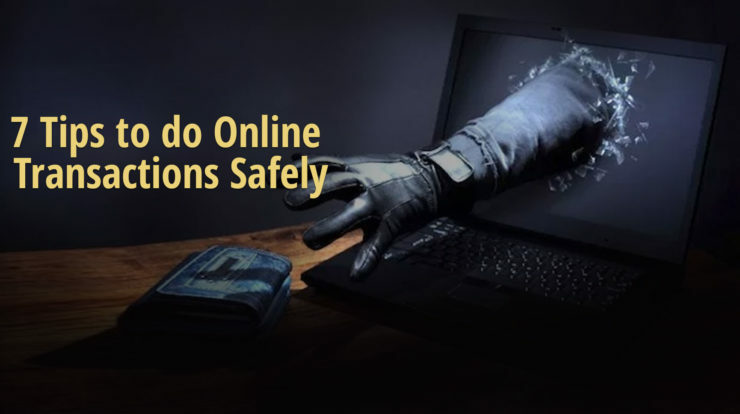 Here are 7 tips for safe online transactions. Install latest security software – It is always a good idea to install good antivirus software in your system as the World Wide Web is full of malware, spam and spyware. And as the old adage says ‘Prevention is better than cure’ and the same is true for all online transactions. Use password which are hard to crack – Majority of the people use common passwords for a number of transactions including sensitive transactions like net banking and credit cards for the convenience of recollecting which ultimately pose a threat to their password security. Ensure to use alpha numeric passwords for all different transactions. Don’t Use public Wi-Fi connection while doing online transaction – Always make sure to use your own personal computers, mobile phones to make any kind of transaction. Also, ensure that you always connect to the internet using a secured Wi-Fi connection which is password protected. Doing financial transactions over a public Wi-Fi connection is highly unsafe and not recommended. Don’t Respond to emails asking about your details – Any promotional mails asking for your bank details should be ignored and reported as spam. Remember that your bank will never ask for your bank credentials. Don’t Respond to emails offering you discounts – You might be getting a lot of promotional mails from retail companies. But while utilizing such offers, it is always recommended to go directly to the seller’s site rather than entering details in the coupon link, which is usually sent by third parties. Check website’s SSL certificate – A lot of small vendors do not incorporate security mechanisms which may compromise your security. So, it’s always advisable to make online transactions on websites that begin with “https”. Do not trust websites that begin with “http”, this means that the website isn’t using proper encryption. Online shopping tips – Always log out of your bank and merchant sites after completing your online transaction. Never save financial passwords on your computer. Still worried about online payments? With atom technologies you don’t need to anymore. atom technologies is compliant with Payment Card Industry Data Security Standards (PCI-DSS V-3.2) to ensure that your transaction data is 100% safe. Get atom online payment gateway for your business to ensure safe & secure online transactions!